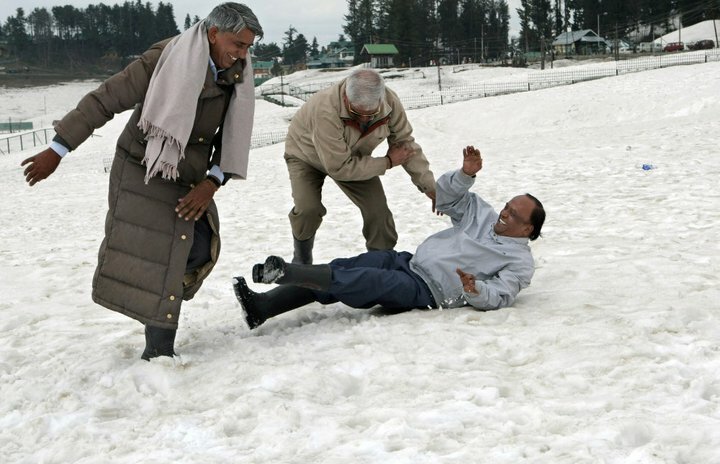 M S Yadav (extreme left) can be seen playing to the hilt – Ye Kashmir Hai !!! This ‘trade union leader’ opposed to me travels only by air. Ask him when did he travel by train, last !!! Frequently… almost always… he uses our management’s office vehicles for all private purposes. Whole day, he can be seen either conspiring against his colleagues or sitting/eating with management staffs. In the last 12 years or so, since I know him, I haven’t seen him doing any work that benefits my organization i.e. PTI or The Press Trust of India Ltd. that pays him wages. Yet, his annual increments and promotions come like butter and butterflies. All because… his activities… whatever… are liked by my management. I am given to understand that he has risen to become Senior Regional Engineer, a designation that he cannot even spell properly. If all these are happening in PTI, which is situated in front of Indian Parliament and behind the Union Labour Ministry, nothing remains to understand what would be happening in rest of the media or trade unions in the country! Recently, he claimed to be fighting for journalists’ wage board but was spotted holidaying in Kashmir. Uff ye garmi !!! Call him to hear how does he speak a la James Bond… “I Am Yadav, M.S. Yadav”. Those who know him won’t disagree that he is not a trade union; he actually trades in unions. Google has more information about him, perhaps. He has ‘issued’ resolutions against me [ah, that was too much]… resolutions that were handed over to the management to take action against me!!! LOL… he has given me numerous threats. Even telephoned me, signalling white hankies [without actually having any right intentions]. Today, many many employees of PTI live under the terror that he has unleashed, together with the officials of the management. I am hopeful though. Truth must win, Cheats must lose. Until then, help me live well because only living well is the best revenge. Kewl. STOP PRESS: Did Justice Majithia travel with him too in a helicopter to a destination in Kashmir!!! Please wrong me so that I can delete this sentence, at least! Previous …see how NDTV planted this story! hi neeraj. uff ye garmi is lovely … perfect. at the same time, wondering what use it is. but the fight must go on. This Senior Regional Engineer’s son’s marriage reception was hosted by one of the former Economic Editors in Delhi’s biggest marriage lawn. From Chaprasi to CEO, all GMs and enslaved staffers attended and handed over big “lifafas” to this mafia of journalists’ trade unions and self styled federation. About Rs.1 Crore was spent, and the same was collected through “lifafas”. Air travel, 5-star stay, sharab and kababs are frequent “mauj-masti” of this very senior regional engineer when he is in Rajasthan. A “maha-abhiyog” should be initiated against this fraud and corrupt man who has seduced entire PTI for his family. God bless you Neeraj for putting up this very picture. Being one, I know the filth and garbage collected in and around trade-union movement of our country is now emitting stinking odor. The opportunists and collaborators have captured a genuine cause and worked up the things to their own advantage, even compromising the interests of members, whom they are representing. The question is, why such people are not being thrown out by the members, perhaps because none is ready to take up that inner struggle, very much part of the movement. By equating this state of decline with the present day conditions in our polity will be a big mistake, since working class has a historical responsibility on them and their poor and pitiable response will be anti-people. The fight cannot be blunted by a few individuals, it must go on and there is no resting till such forces are exposed and eliminated. Long live the revolution. These types of trade union leaders are the keep of the management, which make profit at the cost of workers.